sbeadex™ magnetic microparticles enables the automated high-throughput extraction and purification of high quality DNA preparations. A novel two step binding mechanism via an adapter allows binding of nucleic acids more specifically. Final washes with pure water deliver nucleic acids in high yield, purity and quality. sbeadex chemistry is perfectly adapted to our high-throughput extraction platform: the oKtopure™. sbeadex for: plant, blood, tissue, forensic and plasmid extractions. The particles used in the sbeadex™ and mag™ kits are modified superparamagnetic particles, which allow efficient and high quality purification of small and large DNA fragments. These allow efficient and high quality purification of small and large nucleic acid fragments of several sample materials. The beads are attracted by strong permanent magnets, but they do not become permanent magnets. LGC developed standard protocols on a broad variety of robotic platforms for extractions of all major plant species, plant samples and other sample matrices. As protocols on the KingFisher platform can easily be transferred and installed, we provide application notes based on our sbeadex standard chemistry. For all other robotic platforms and sample material not mentioned, please contact us. 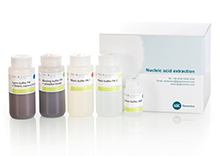 The extractions team is very experienced with a wide range of sample matrices, having worked with all kinds of samples in our DNA extraction service laboratories. We are able to send you DNA extraction protocols for many sample types that are not mentioned here.